Publisher: New York: Atheneum Books for Young Readers, 2001. “To see who is the best,” said Sage. 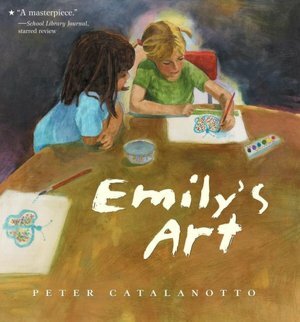 Synopsis: Emily is arguably the best artist in her class, but when the judge of an art contest thinks Emily’s picture of her long-eared dog is of a rabbit, she decides to stop drawing. She learns to accept herself and to be proud of her talent – and her teacher learns in the process as well. The book begins with an art contest to decide who is best, and ends with an art party to celebrate all the artists in the class. Activities/Resources: Interesting discussion starters for using Emily’s Art in Teaching Children Philosophy. After discussing the book, children could be encouraged to draw their own art and have their own art party, celebrating the unique talents of each of them. # 8 in Perfect Picture Book Fridays. See all this week’s Perfect Picture Books at Susanna Leonard Hill’s blog, or find the entire listing at her Perfect Picture Books tag on her blog. So, we were both drawn to art this week 🙂 What an awesome opening sentence! Classy! And then finishing with a party, this sounds like a very well crafted picture book with a great self esteem theme. Thanks for sharing it, Beth. Art’s a good thing to be “drawn” to! Heading over to read yours… it’s “just getting up time” in BethLand. You’re welcome, Susanna! I hope you like the book as much as I did. I’m going to have fun this year, scouting out books about the arts. This sounds like a darling book. I would certainly read this with my daughter, maybe get her to share her thoughts on the topic of uniqueness and creativity. You’re welcome, Angela! It would be great to use the book with your daughter in that way. Your daughter’s experience is so similar to Emily’s — I’m glad she’s taking it in her stride. Thanks, Kerry! Very nice choice Beth. I’ve read this book and just loved it! It really has some very good lessons for children about creativty, finding one’s talent and pride. Glad you shared this as it is a PPB. Thanks, Pat. It’s always good to hear from someone who has also read the book. Start ’em young, and give them lots of opportunities and different ways of doing things — and encourage their attempts! This book sounds like the perfect picture book on who’s decision is best, the person who learns how to accept themselves as is or the best as defined by the contest. This is a valuable lesson to learn and it seems valuable to learn it as a young child because many of take all our life to learn it. It also seems like the book taught it without seeming preachy which is an art in itself. I must read it as I am having trouble on this front with a picture book I’m writing. Thanks for selecting this favorite. You’re welcome, Clar! Glad you stopped by. Yes, I’d definitely recommend you read this book. This was a great choice Beth! Good for Emily! I also liked that it wasn’t so much who won but in celebrating the talents of all the children. Having fun! It took time for the teacher to learn that a competition wasn’t the best route. This is a nice message. I know sometimes I wish I was better at somethings I want to be good at. It’s a good message to keep trying and be happy with what you can do. Good Choice! I feel the same way about things I wish I was better at, Erik! Thank you! I love moralising books, and this is right up my alley. 😉 That is a great cover, the use of colour reminds me of the Old Masters. Thanks for introducing it! Oh this looks like a wonderful book! As an artist, I can so relate easily to the subject matter. It sounds like it has excellent message.Thanks for your nice comments on my blog btw. Thanks, Loni! I think you’d love this book, and have a particular affinity for both the subject matter and the protagonist. And the comments on your blog were well-deserved! This book seems to be creating a bit of stir- just 24 hours ago I hadn’t heard of it, but since then someone tweeted me to recommend it and now I come across it here as part of the comment challenge. I do hope I can find it here in the UK. Oh, I do hope you can find it, Zoe. It’s a delightful book — shows how adults can get the wrong end of the stick sometimes, and what effect this can have on children — and is also a great celebration of art. Thanks for visiting! Hope you’ll be back! Art party! When I saw that, I thought it might be fun to use this as part of an art-themed birthday party. Love the description of the story. I love your idea of doing an art-themed birthday party! That would be such fun! Never heard of it. Nice choice. Curious to see how the story is written. It sounds lovely! I haven’t come across this book before ~ so glad you highlighted it. Thanks, Barb! I think it would be a good book to use with Grade Ones.